Package Man is an indie title currently in development by a single developer, Doctor ORBiT, who is based in Germany. The game puts you in the shoes of a courier worker who provides services to FedUp and SUP (in pure GTA style, parodies of FedEx and UPS). The job includes loading up as many packages as you can at the start of our day, to then go out on your route to deliver them. It’s a modern twist on the classic game Paper Boy, but we can feel this game is building an identity of its own. You can currently download a demo and try out the mechanics around loading the truck and delivering the packages over the course of 5 days, but there are a lot of new exciting additions we will be seeing in the near future. DO: The game is a physics based package delivering simulator. It’s all about your skill in managing and maintaining your delivery company. I’ve gotten the idea from the cult classic Paper Boy from 1985. I wanted to revitalize a much beloved game with a modern spin to it. RS: Which platforms will Package Man be released on? DO: It’s planned to be available for all major platforms: Xbox One, PlayStation 4, Nintendo Switch, PC (Windows, Mac, Linux), Android, and iOS. So far I’ve gotten support from ID@Xbox and am looking forward to working with them. The other platforms, except for PC, are still in the planning stages. DO: This is not my first game, but it’s definitely the first game I made which I decided you make into a full project. You can see one of my other games on my itch.io page. I’ve been making games (or rather goofing around with game making) for the past 4 years. 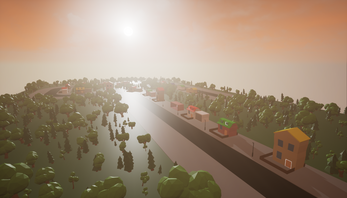 The game features simple, yet colorful and crisp visuals. RS: Most gamers at some point of their lives get the itch to make their very own videogame. What advice would you give to anyone wanting to start developing? DO: I really recommend you just start developing games immediately. Through the power of the internet, learning any type of skill has become easier than ever, Google is your friend. Besides there being billions of tutorials out there, you can also get a lot of game engines for free nowadays. RS: Which games did you draw inspiration from? DO: I drew inspiration mostly from Paper Boy, but I started making the game before I even knew Paper Boy existed. Sounds weird, but since I’m from Germany I never got to play Paper Boy on an arcade or something similar. RS: Do you have anyone in the gaming industry that you look up to? RS: We recently played v.1.3.1. What can we expect from future versions? You can expect a lot from the future of Package Man! My most anticipated features that I have planned include but are not limited to: Story mode (customization and upgrading of your delivery company), Multiplayer (Versus and Co-op modes), VR mode, customization, achievements, and much much more. RS: Where can our readers learn more about your game? DO: I think the best way to learn about the game would be to go to my page or to join our Discord. Anyone can message me there with any kind of question! I’m also on Instagram (@doctororbitdev). If you ever played and enjoyed delivering newspapers back in the 80s, I’d recommend you give this game a try. The simple mechanics make this a game that’s easy to pick up, yet hard to master. Trying to land that highlighted window or door every time is more challenging than it seems, and you’ll never feel like you have enough time to load up as many packages as you’d like onto the truck. Talk about wanting to over-deliver (pun very much intended!). The Discord set up for this game is also very active, and Doctor ORBiT has made an extra effort to be open to the community, so if you have any additional questions around the development of this game, you should certainly join. If you like our gaming-related posts and reviews, be sure to sign up to our mailing list, or follow us on Instagram, Facebook and Twitter. I've been a gamer since the SNES days and Donkey Kong Country was the first game I ever owned. I currently work as a management consultant, and my console of choice is the Nintendo Switch, which I carry with me during my travels. Next Next post: 10 Q Reviews: Overwatch – the world could always use more heroes! 10 Q Reviews: Overwatch – the world could always use more heroes! 10 Q Reviews: Uncharted 4: A Thief’s End – time to find a legendary lost treasure. Again. Again. Again.